We’ve got some Great Homes to view THIS WEEK !!!! Call Amy 405-694-9294 or Tayler 405-905-8226 …. and they will show you the WAY !!! 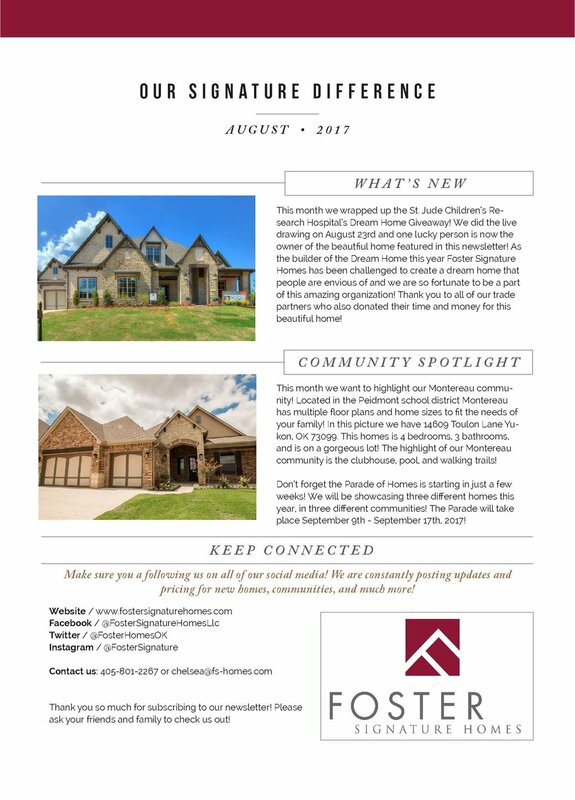 For the past two years we, Foster Signature Homes, have been asked, “Why St. Jude and why the Dream Home?” Well at Foster Signature Homes, we are a family oriented business and what is more family oriented, than an organization that’s mission is to keep families together. I don’t know about you but over the years I have accumulated a lot of “stuff.” Things I don’t need, rarely use, have had for years, and things that just take up space! In my blog post, 30 Tips for Moving, we discussed how we need to declutter our house before we start packing. Well today I am sharing with you some techniques, and helpful organizational thought processes on how to successfully declutter your home! The following is a list of items we recommend to be in your Emergency Kit. Be sure to consider each family member’s individual needs; physical and/or emotional. Now that you have closed on your new Foster Signature Home we wanted to give you a few tips we have found that are helpful when moving into a new home, especially a new construction home! Moving is stressful, when moving into a new home people are more motivated to only take the things you absolutely need. Take this opportunity to make sure you declutter your home and don’t pack things you don’t need. We are so excited that you have chosen Foster Signature Homes as your new home builder! Along with new homes comes minor fixes and things that you may need our help with! I hope that this brief warranty description has been helpful as you begin your journey with us. Whether you just recently closed or closed 6 months ago, we are always willing to help guide you through our process or recommend companies that we use! When you begin the process of looking for a new home there are multiple factors that will shape the decision of should I buy or build? If you are willing and ready to build, a custom home builder is somewhere you can start. An established home builder like Foster Signature Homes, is perfect when you’re looking for a unique and fully customized home and have the time and drive to start from the very beginning. Please visit us this weekend and the next at 4221 Las Colinas Ln from 1pm - 7pm. Our Las Colinas Community is located off of West 48th, between Tecumseh and Rock Creek Rd in Norman. See You Soon !!! !